4/25/13 – The extrusion for the fence is finished. This plane will be part of the Museum exhibit this summer. We will be showing the step by step process of this plane. 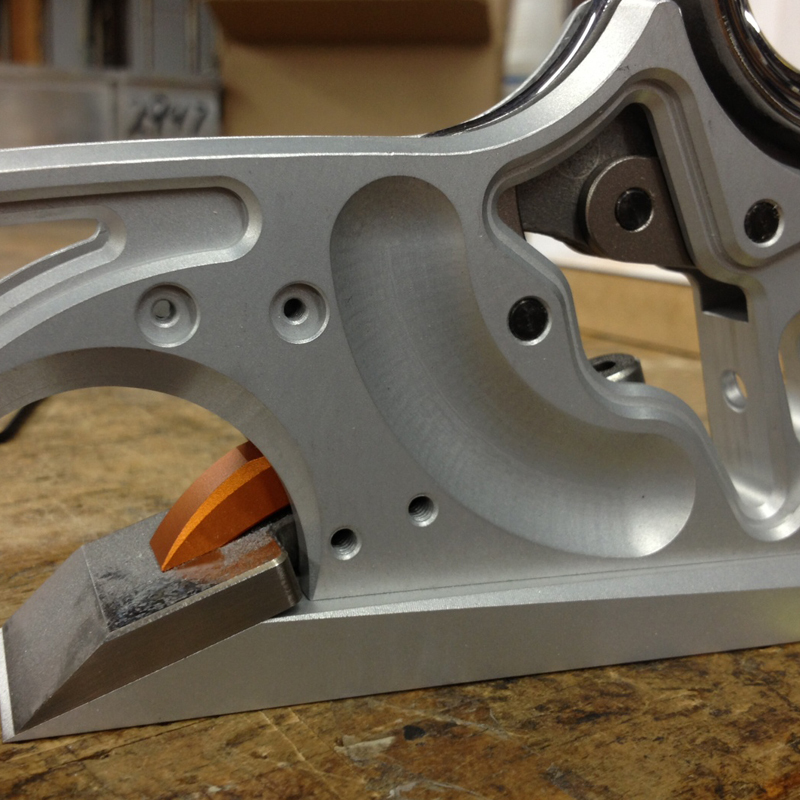 From billet, to machining to finishing. I’ll try and demonstrate every possible step of it along the way. It should be cool to see. 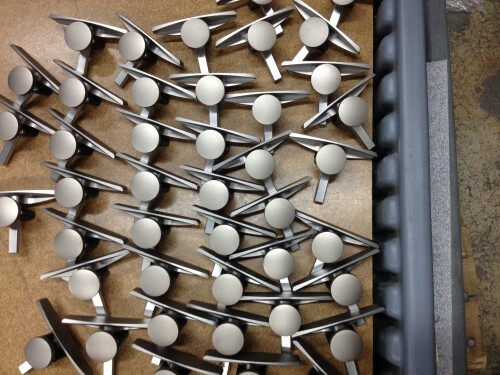 I am waiting on the due date of the cast handles for these from the foundry in Washington. 5/9/13 – We have most of the handles already cast. I will need to order more to cover the orders we have though. Full steam ahead on these as soon as the SERP Planes are done. 5/30/13 – I have the bulk of the handles in hand which is huge for the timeline. The shops are just finishing up the SERP parts so they will be ready to go with the HP-10 shortly. We are now trying to sort out the best storage system for the the HP-10 series and try to establish the best system from the start as opposed to what happened to the HP-6 series which evolved more haphazardly. I have yet to see the ultimate HP-6 sole storage solution and would be curious to see any designs that are out there. 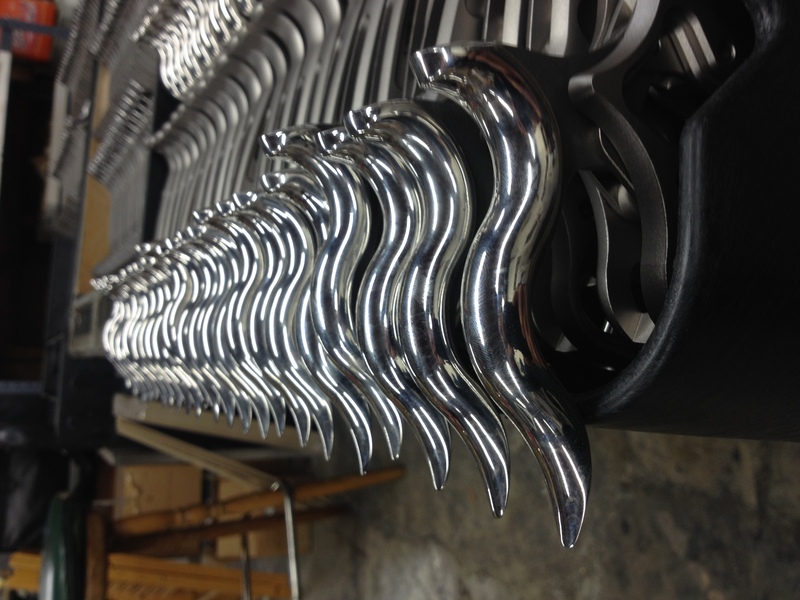 06/13/13 – All of the bodies and stainless cast handles are in process. They look to be 8 weeks out for those 2 parts. 07/11/13 – All of the mating parts are about to start up. After completing the stainless version I am excited to use this one. The stainless version works wonderfully. 07/18/13 – Cruising along. Everything is in the works with 4 different shops. 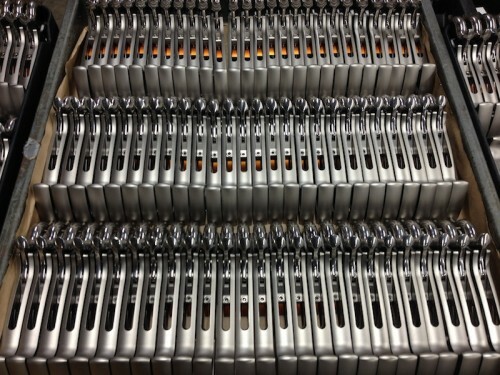 08/01/13 – The bodies are done being machined. These will go to bead blast and anodizing now. The remaining parts are in process now. 08/08/13 – I brought samples of the operations over to the museum this week. For anyone headed here, you will be able to see the HP-10 in various stages of machining. I was hoping to have more samples provided of the machining process, but alas only 3 were made. 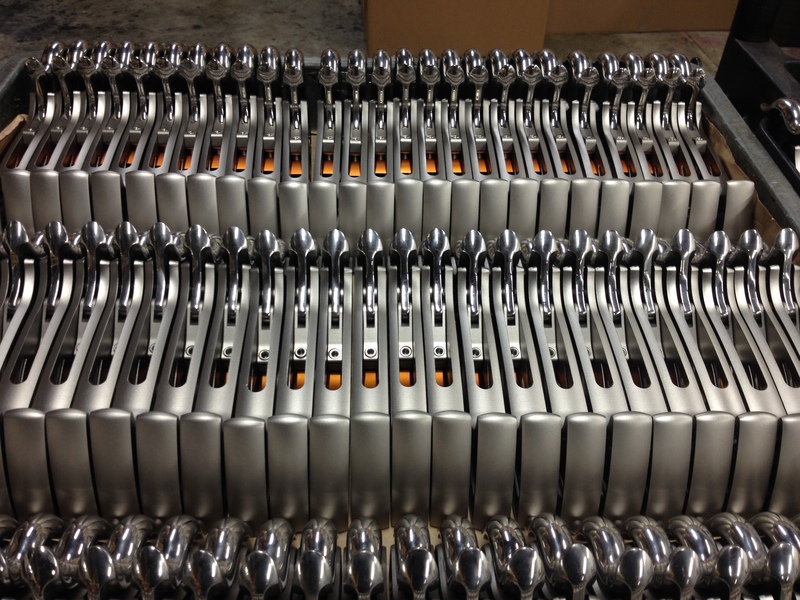 08/22/13 – Handles are being buffed, bodies are being touched up. Soles are being cleaned up. 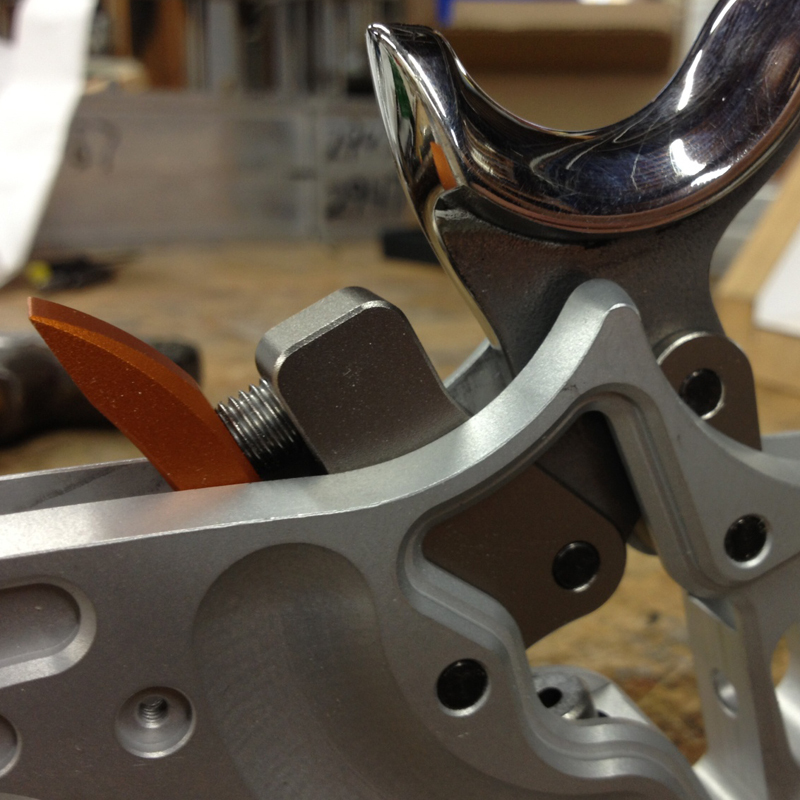 The handle mechanism is being anodized. The aluminum body feels pretty good with the stainless steel handle. The weight is all in the palm of the hand with little weight cantilevering out. I like it. 09/5/13 – Lots of parts starting to pour in. I will be starting the handle subassembly next week since the polishing will be complete then. The sweet little orange clamp pad is so cool. It looks great in the champagne colored body. Oh, speaking of champagne anodizing color: I heard this week that Apple might be producing their next phone with a “gold/champagne” color. I thought that was interesting. This week I mentioned that little tidbit while I was at the anodizing facility. The shipping department manager smiled at me and said, “Well, you know that our former plant manager is now working at Apple on their colors?” So, it looks like Apple may be taking page from BCTW’s book and using our sweet champagne color! We’ll see next week if it happens. The irons are at the heat treater at the moment. 09/12/13 – I was right! Champagne color everywhere! 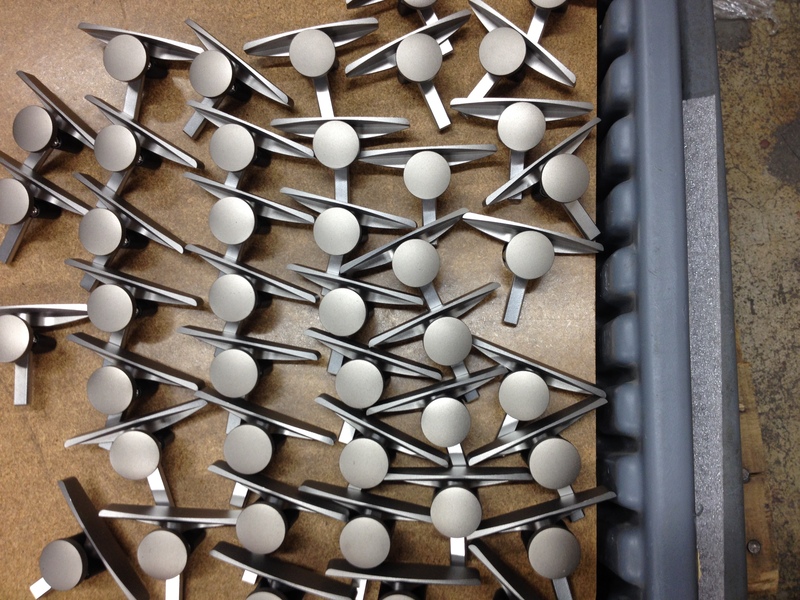 Pins went to the Black Oxide factory this week. Filthy place with large dogs, cots in the office.., a bit sketchy actually. Irons got heat treated, and surface ground. Time to go to the lapper. Got word from the Box company and I think they will be the next bottle neck. They are in the midst of making christmas product. We’ll see. I need to buff the bodies a bit next week then off to anodize. 09/19/13 – Blades are being lapped. Fences are being machined. Bodies just about completed with a buffing operation. The depth stop components wrap up tomorrow and should have them in hand early next week. 09/26/13 – All of the depth stop parts are in hand. Some are already at anodizing. Sub assembly stuff is starting to happen. I see this stuff going out by the end of October. Lots of product shipping in October! 10/03/13 – One last minute machine operation to clean up the body. 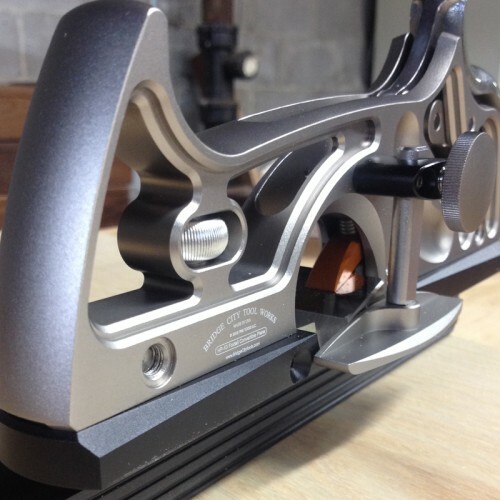 Then anodizing will happen on those. Irons are all lapped. Ready to be ground. 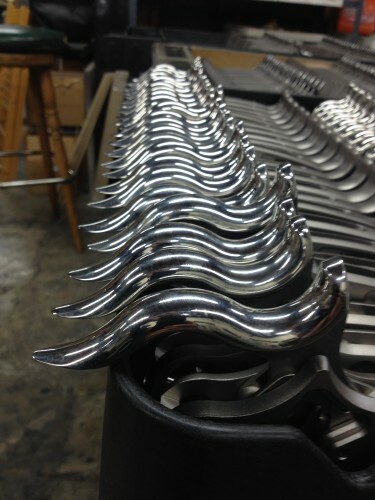 The handles are polished and done. 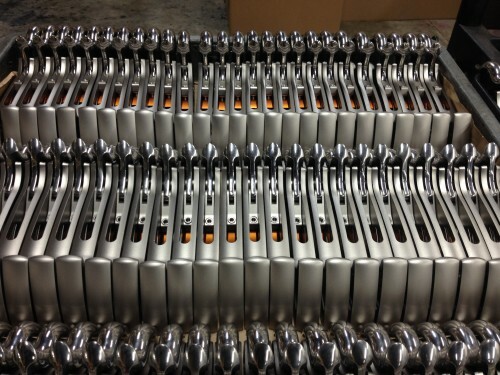 Sub assembly on the handles will start end of next week. 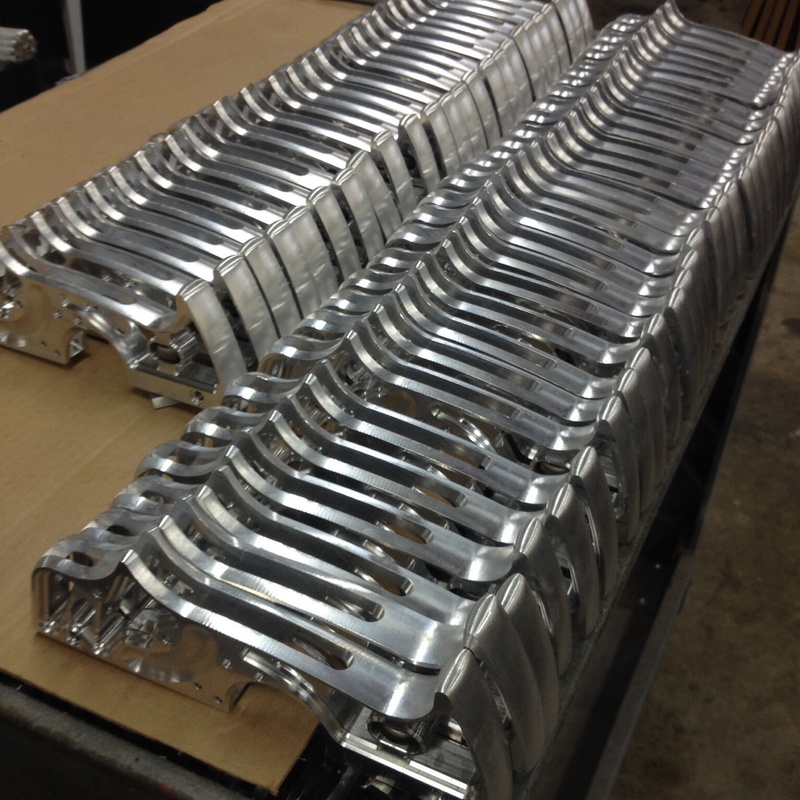 10/10/13 – Body and soles are at anodizing. These should be shipping beginning of November. 10/24/13 – Lots of progress on these this week. Bodies went to the laser facility today for engraving. Soles are back. Scoring cutters are at the grinder to grind them flush and sharp. Handle assemblies are almost done as are the Depth Mounts. The packaging is a big unknown right now and may be our bottle neck for early november shipping. 10/31/13 – First plane off the line about 30 minutes ago. Looks fantastic, works great. PHEW! Final assembly is full steam. These will start going out the door next week. This one is going on display at the Museum, otherwise it would go to Fred. 11/7/13 – Shipping starts on Monday! 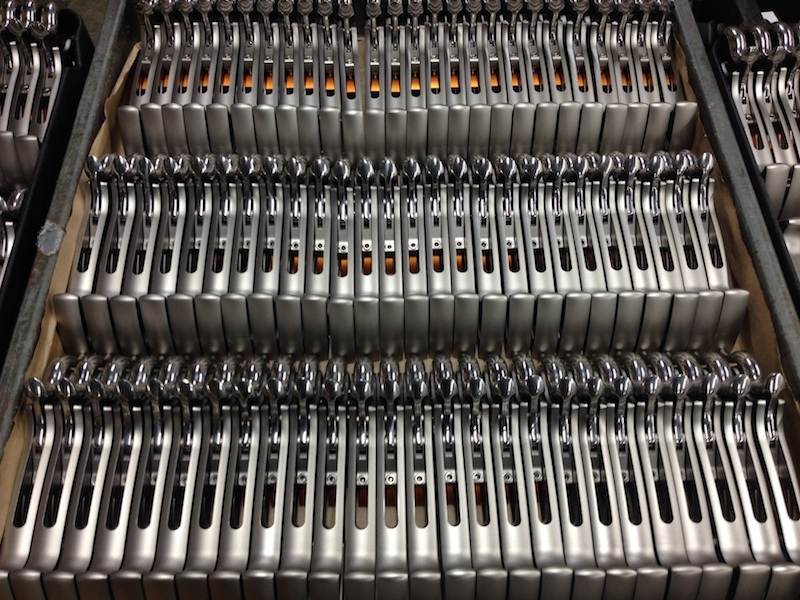 11/14/13 – Most of the orders went out this week. Next sole getting ready to be released! We do have some extra planes and Rabbet Profiles if anyone is interested send us an email. Exciting! I can hardly wait! WOW! Them’s a lot of HP-10’s!!! !